I follow Domino Sugar on Twitter, and they recently posted a link to Brown Sugar Brownies. Not blondies, mind you, but chocolate brownies with brown sugar instead of white. I was immediately intrigued and knew I was going to have to make brownies that night. However, I took a closer look and decided to alter a different recipe instead of using my inspiration recipe. The Domino Sugar recipe batch was too small, and it called for beating the butter. This made me skeptical because most brownie recipes called for melting the butter. From Smitten Kitchen, I found the Baker’s Chocolate One Bowl Brownies. 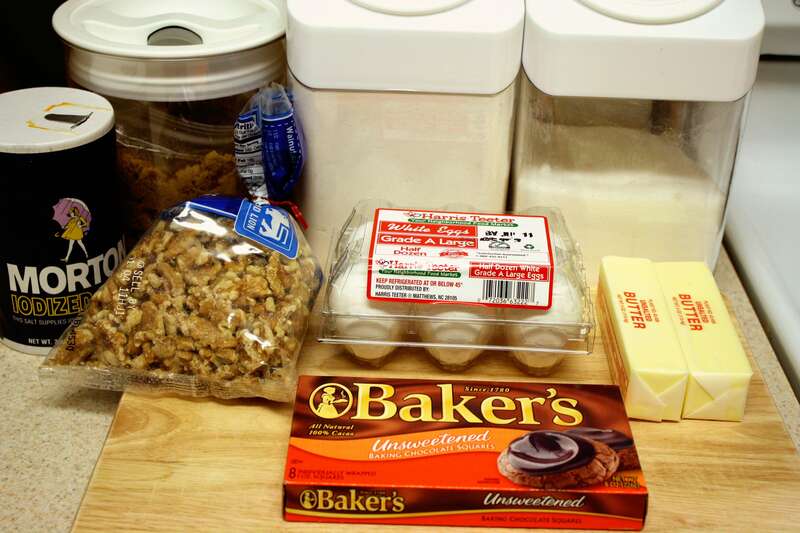 I assembled my ingredients – simple! Only 9 items (I didn’t have vanilla but you should add it). 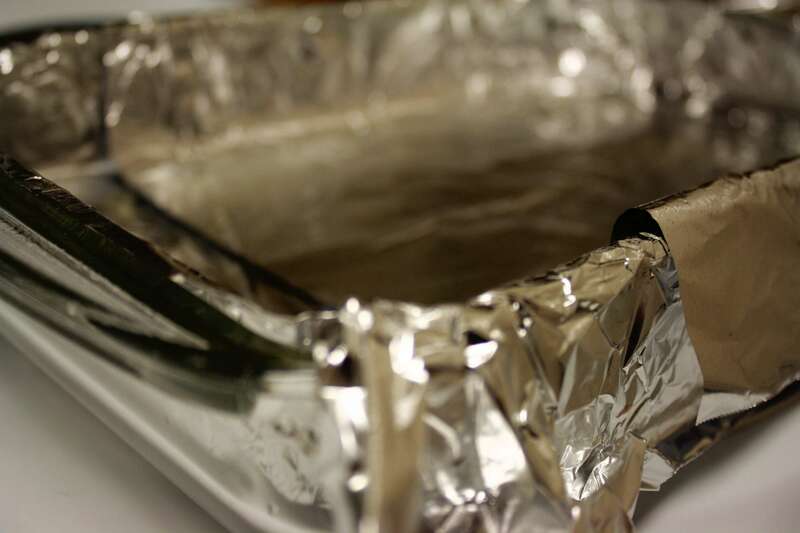 I lined a 9×13″ pan with foil (2 pieces, horizontally across the dish) and sprayed with PAM. 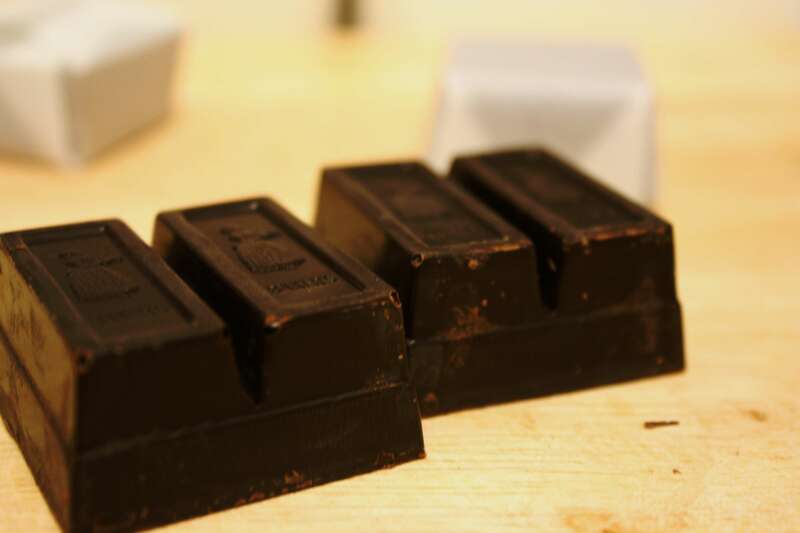 I love those little squares of Baker’s Chocolate – there’s something so comforting about the solid- and square-and old-fashioned-ness of these. Or something. Baker’s Chocolate also, incidentally, always reminds me of the part in Steve Almond’s book Candyfreak where he talks about the cruelty of unsweetened chocolate to chocolate and candy lovers. After you chop up the chocolate, you melt the butter and chocolate together in the microwave. Gross at first, then delicious. 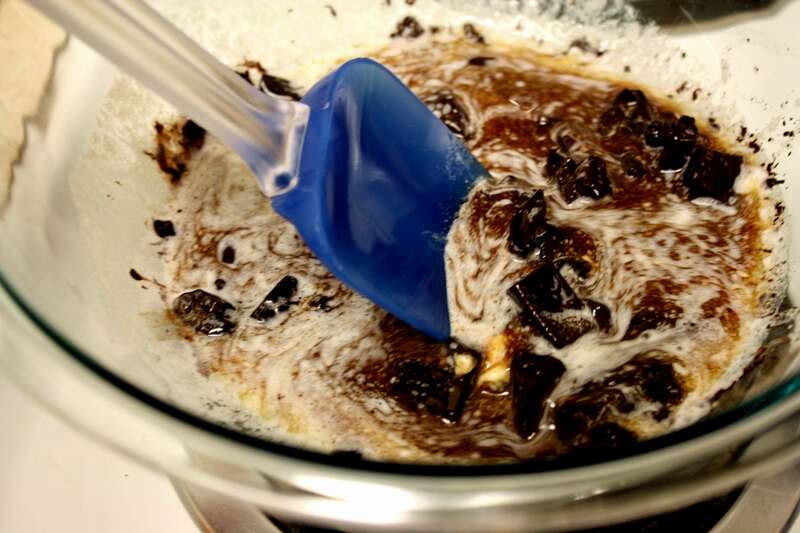 You could do this over a double boiler as well, if you don’t have a microwave. You mix in the sugars – I replaced half the white sugar with brown. After some online research, I was afraid to replace all of the white sugar because I was worried it wouldn’t hold up. However, I think next time I would try more brown sugar. Then you add in the eggs, flour, and walnuts. And here they are after cooking…yummm. Cut up and stacked, ready for co-workers. They brownies turned out wonderfully. I haven’t been able to make brownies from scratch very successfully before, but these were everything I wanted. Moist, chocolatey, thick with a crunchy top. Yum. 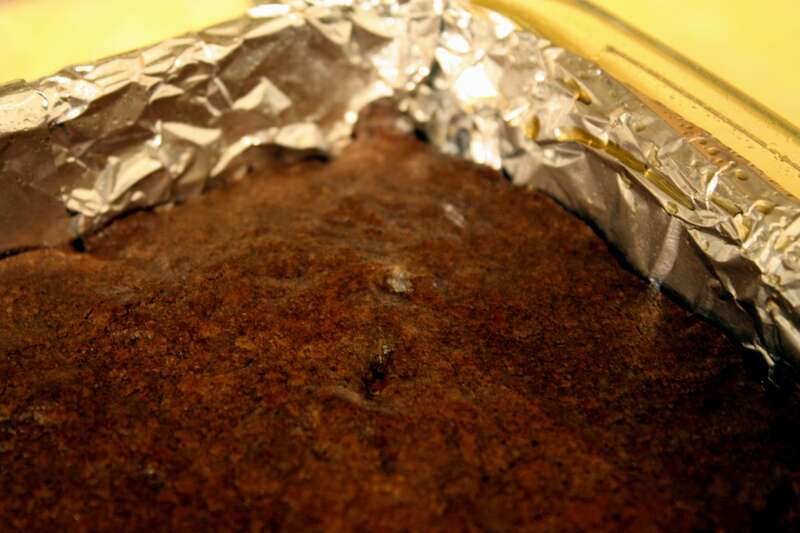 Line 13×9-inch baking pan with foil, with ends of foil extending over sides of pan. Grease foil (I sprayed with baking spray). 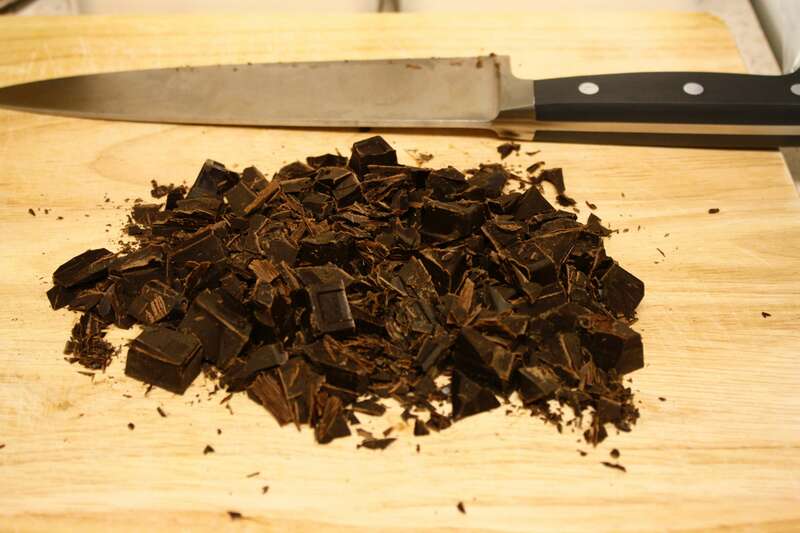 Roughly chop chocolate (it helps it melt faster). 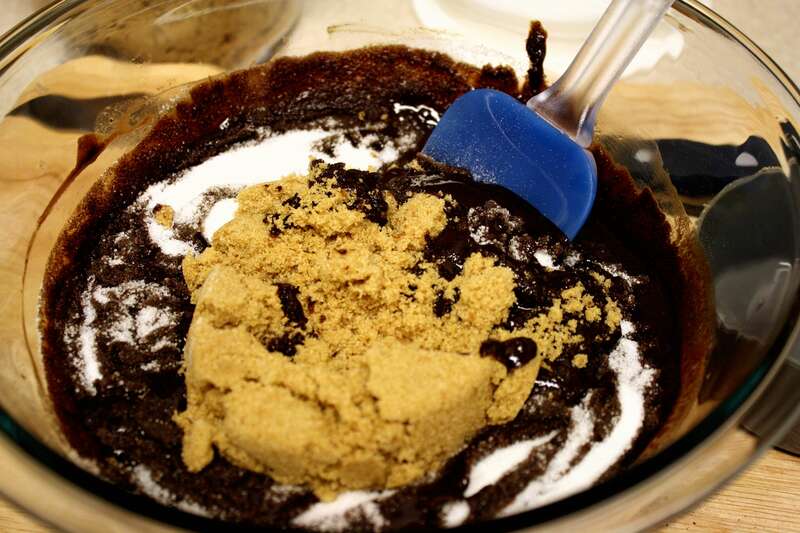 Melt chocolate and butter in large microwaveable bowl on high for 2 minutes or until butter is melted. 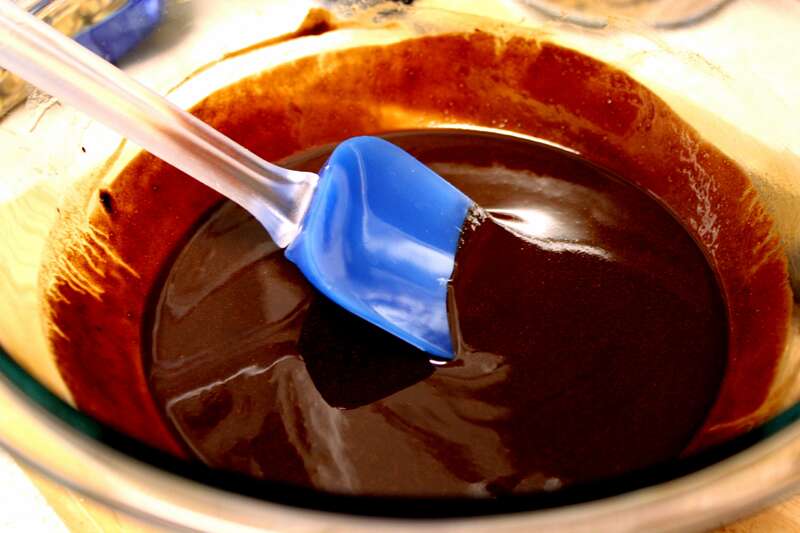 Stir until chocolate is completely melted. 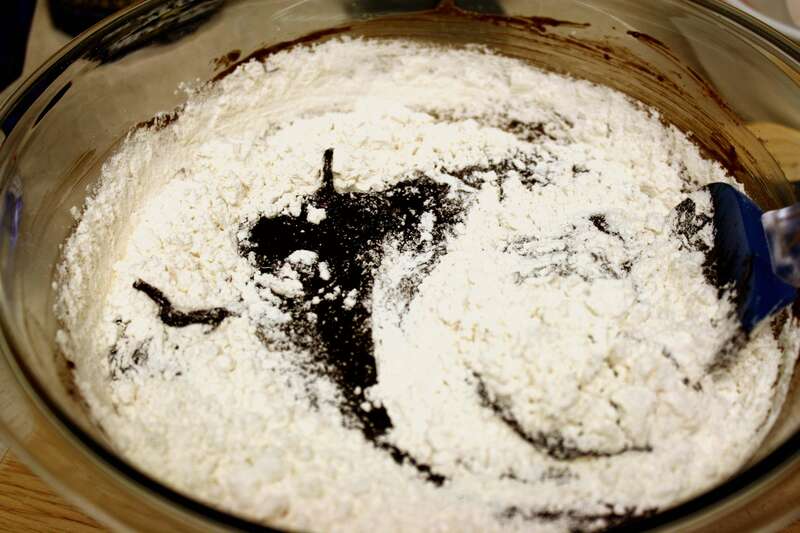 Stir in white and brown sugars. Fold in flour, salt, and walnuts. Bake for 30 to 35 min. or until wooden toothpick inserted in center comes out with a few crumbs. 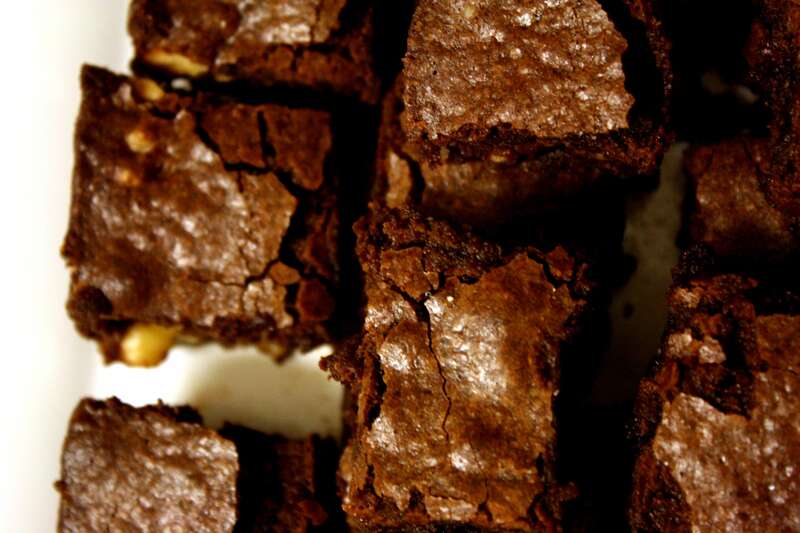 When cooled, remove brownies from pan, using foil handles, and cut into squares. Those pictures looks amazing. The recipe really makes me wanna bake. I can’t wait to try it. Thanks for sharing. Thanks for checking it out – I hope you like them!